Tissue mechanics is important for development; however, the spatio-temporal dynamics of in vivo tissue stiffness is still poorly understood. We here developed tiv-AFM, combining time-lapse in vivo atomic force microscopy with upright fluorescence imaging of embryonic tissue, to show that during development local tissue stiffness changes significantly within tens of minutes. Within this time frame, a stiffness gradient arose in the developing Xenopus brain, and retinal ganglion cell axons turned to follow this gradient. Changes in local tissue stiffness were largely governed by cell proliferation, as perturbation of mitosis diminished both the stiffness gradient and the caudal turn of axons found in control brains. Hence, we identified a close relationship between the dynamics of tissue mechanics and developmental processes, underpinning the importance of time-resolved stiffness measurements. Neurons in the brain form an intricate network that follows a precise template. For example, in a young frog embryo, the neurons from the eyes send out thin structures, called axons, which navigate along a well-defined path and eventually connect with the visual centres of the brain. This journey requires the axons to take a sharp turn so they can wire with the right brain structures. Axons find their paths not only by following chemical signals but also by reacting to the stiffness of their environment. In an older frog embryo for instance, the brain is stiffer at the front, and softer at the back. As neurons from the eyes make their way through the brain, they turn to follow this gradient, moving away from stiffer areas towards the softer regions. Here, Thompson, Pillai et al. investigate when and how this stiffness gradient is established in frogs. To do so, a new technique was developed. Called time-lapse in vivo atomic force microscopy, the method measures how brain stiffness changes over time in a live embryo, while also taking images of the growing axons. The experiments show that the stiffness gradient arose within tens of minutes, just as the first ‘pioneering’ axons from the eyes began to grow across the brain. These axons then responded to the gradient, turning towards the softer tissue. Changes in the number of cells in the underlying brain tissue governed the formation of the gradient, with rapidly stiffening areas containing more cells than those that remained soft. In fact, using drugs that stop cells from dividing reduced both the mechanical gradient and the turning response of the axons. The technique developed by Thompson, Pillai et al. is a useful tool that can help elucidate how variations in stiffness control the brain wiring process. It could also be used to look into how other developmental or regenerative processes, such as the way neurons reconnect after injuries to the brain or spinal cord, may be regulated by mechanical tissue properties. During embryonic development, many biological processes are regulated by tissue mechanics, including cell migration (Barriga et al., 2018), neuronal growth (Koser et al., 2016), and large-scale tissue remodelling (Butler et al., 2009; Munjal et al., 2015). Recent measurements at specific time points suggested that tissue mechanics change during developmental (Koser et al., 2016; Iwashita et al., 2014; Majkut et al., 2013) and pathological (Murphy et al., 2011; Moeendarbary et al., 2017) processes, which might significantly impact cell function. Furthermore, several approaches have recently been developed to measure in vivo tissue stiffness, including atomic force microscopy (Barriga et al., 2018; Koser et al., 2016; Gautier et al., 2015), magnetic resonance elastography (Sack et al., 2008), Brillouin microscopy (Scarcelli and Yun, 2012), and magnetically responsive ferrofluid microdroplets (Serwane et al., 2017). However, the precise spatiotemporal dynamics of tissue mechanics remains poorly understood, and how cells respond to changes in local tissue stiffness in vivo is largely unknown. To enable time-resolved measurements of developmental tissue mechanics, we here developed time-lapse in vivo atomic force microscopy (tiv-AFM), a method that combines sensitive upright epifluorescence imaging of opaque samples, such as frog embryos, with iterated AFM indentation measurements of in vivo tissue at cellular resolution and at a time scale of tens of minutes (Figure 1). A fluorescence zoom stereomicroscope equipped with an sCMOS camera (quantum yield 82%) was custom-fitted above a bio-AFM set-up (Figure 1—figure supplement 1), which had a transparent pathway along the area of the cantilever. To cope with the long working distance required for imaging through the AFM head, the microscope was fitted with a 0.125 NA/114 mm WD objective. The AFM was set up on an automated motorised stage containing a temperature-controlled sample holder to maintain live specimens at optimal conditions during the experimental time course. (Figure 1a,b) (see Materials and methods for details). Experimental set-up for combined time-lapse in vivo AFM (tiv-AFM). (a) Schematic (not to scale) and (b) photograph of the experimental setup. An AFM with 100 µm z-piezo range is positioned above a temperature-controlled sample chamber containing the specimen. A custom-fit fluorescence zoom stereomicroscope with a long (114 mm) working distance and NA 0.125 objective, connected to a high quantum-efficiency sCMOS camera, is mounted on a custom-built support stand above the AFM head optimised for trans-illumination. The specimen is moved by a motorised x/y stage to allow AFM-based mapping of large areas. (c) (Top) Schematic of a Xenopus embryo, showing both how the brain is prepared for tiv-AFM and rostral-caudal (R/C) and dorsal-ventral (D/V) embryonic axes. All following images of embryonic brains in vivo will have the same orientation. (Bottom) Close-up diagram of the brain, showing the approximate region mapped by AFM (white dashed line), within which optic tract (OT) axons (blue) turn caudally. Also shown are the regions of interest (green boxes) used to calculate brain stiffness rostral and caudal of the OT, and hence the developing stiffness gradient. Red overlaid lines show calculation of the angle through which OT axons turn (turn angle). We tested tiv-AFM using the developing Xenopus embryo brain during outgrowth of the optic tract (OT) as a model (Figure 1c). In the OT, retinal ganglion cell (RGC) axons grow in a bundle across the brain surface, making a stereotypical turn in the caudal direction en route that directs them to their target, the optic tectum (McFarlane and Lom, 2012). We previously demonstrated that by later stages of OT outgrowth (i.e. when axons had reached their target), a local stiffness gradient lies orthogonal to the path of OT axons, with the stiffer region rostral to the OT and softer region caudal to it (Koser et al., 2016). This gradient strongly correlated with axon turning, with the OT routinely turning caudally towards softer tissue (Koser et al., 2016). We therefore wanted to determine when this stiffness gradient first developed, whether its emergence preceded OT axon turning, and what the origin of the stiffness gradient was. To answer these questions, we performed iterated tiv-AFM measurements of the embryonic brain in vivo at early-intermediate stages, that is, just before and during turn initiation by the first ‘pioneer’ OT axons. The apparent elastic modulus K, which is a measure of the tissue’s elastic stiffness, was assessed in an ~150 by 250 µm raster at 20 µm resolution every ~35 min, producing a sequence of ‘stiffness maps’ of the area (Figure 2—figure supplement 1). The applied force (F = 10 nN) and cantilever probe (r = 18.64 µm) were chosen to measure the stiffness mainly of the top ~20–30 µm of the tissue, within which RGC axons grow (Holt, 1989; Harris et al., 1987). To reduce noise, raw AFM data were interpolated and smoothed in x-, y-, and time dimensions using an algorithm based on the discrete cosine transform (Figure 2a,b, see Materials and methods for details) (Garcia, 2010; Garcia, 2011). Simultaneously, we recorded optical time-lapse images of fluorescently labelled RGC axons growing through the region of interest (Figure 2a, Figure 2—figure supplement 1). Development of a stiffness gradient in the Xenopus embryo brain precedes axon turning. (a) Time-lapse stiffness maps obtained from a tiv-AFM experiment, showing outlines of fluorescently labelled OT axons (blue) and processed AFM-based stiffness maps (colour maps) overlaid on images of the brain. Colour maps encode the apparent elastic modulus K, a measure of tissue stiffness, assessed at an indentation force F = 10 nN. The time in minutes on each frame is taken from the timestamp of the first measurement in each successive stiffness map; the corresponding overlaid fluorescence images were obtained simultaneously. (b) Visualisation of fold-changes in brain tissue stiffness from one time point to the next, based on the interpolated and smoothed data shown in Figure 2a. Colour scale encodes the fold-change in K at each location on the stiffness map, expressed relative to the values at the previous time point, with the exception of t = 0 min, where all values were set to 1.Tissue stiffness changes throughout the time course, with large changes already occurring between ~40–80 min after the start of the experiment. (c) Plot of mean re-scaled values for the stiffness gradient (orange) and OT turn angle (blue). Stiffness values were binned to match the time points of the developmental stages at which cell body densities were assessed. Dashed lines denote linear fits (R2 = 0.99). (d) Boxplots of the extrapolated appearance times of the stiffness gradients and the onset of OT axon turning, relative to the start time of tiv-AFM measurements, with ladder plots for individual embryos overlaid (grey circles/dashed lines). Extrapolations are based on linear fits to the re-scaled data for individual animals (Figure 2c). Stiffness gradients appear significantly earlier than the onset of axon turning (p=0.03, paired Wilcoxon signed-rank test). (e) Scatterplot showing the time delay between extrapolated onsets of stiffness gradients and axon turning, calculated for individual animals. The average delay of 18 min is indicated by the blue line. Boxplots show median, first, and third quartiles; whiskers show the spread of the data; ‘×’ indicates the mean. Error bars denote standard error of the mean. *p<0.05. AFM measurement resolution, 20 µm; all scale bars, 100 µm. N denotes number of animals. To assess whether repeated AFM measurements of the Xenopus brain affect RGC axon growth, we first conducted time-lapse AFM measurements on one group of embryos while we exposed another group to the same conditions without making force measurements. At the end of the experiments (i.e., at stage 37/38), OTs were labelled with DiI (Wizenmann et al., 2009), and their elongation and turning angles measured. We did not find any significant differences between the groups (Figure 2—figure supplement 2), suggesting that repeated AFM measurements do not affect axon growth. We then performed tiv-AFM measurements of developing Xenopus brains. Early in the time-lapse sequence (i.e. prior to axon turning), the stiffness of the brain was similar on both sides of the OT. However, over the time course of the measurements a stiffness gradient arose, mostly due to rising stiffness of tissue rostral to the OT (Figure 2a,b). Visual inspection of the fold-change in tissue stiffness from one time point to the next indicated that significant changes in tissue mechanics were already occurring approximately 40–80 min after the onset of measurements (Figure 2b), that is before axons started turning caudally, suggesting that the tissue stiffness gradient was established prior to axon turning. To test this hypothesis, we quantified the temporal evolution of the stiffness gradient in a small region immediately in front of the advancing OT (Figure 2—figure supplement 1a). At the beginning of each time point in the sequence of tiv-AFM maps, we calculated the angle through which axons turned (‘OT turn angle’). For each animal, minimum and maximum absolute values were rescaled to 0 and 1, respectively (Figure 2c). The projected appearance of the stiffness gradient preceded the projected onset of axon turning on average by 18 min (Figure 2d,e), indicating that axons indeed turned after the stiffness gradient was established, which is consistent with a role for mechanical gradients in helping to guide OT axons caudally (Koser et al., 2016). Based on the first time point at which we detected axon turning in each animal, our data suggested that a stiffness gradient of at least (0.9 ± 0.4) Pa/µm (mean ± SEM) was required for axons to change their growth direction. In line with this idea, RGC axons from heterochronic eye primordia transplants growing through Xenopus brains at stages before the stiffness gradient is established grow rather straight and do not turn caudally in the mid-diencephalon (Cornel and Holt, 1992). We have previously shown that tissue stiffness scales with local cell body density (Barriga et al., 2018; Koser et al., 2015), and that in Xenopus embryo brains local stiffness gradients at later developmental stages (39-40) correlate with a gradient in cell density (Koser et al., 2016). To determine if changes in cell densities are driving changes in tissue stiffness, and thus parallel the evolution of the stiffness gradient at earlier stages, we assayed cell densities using DAPI labelling of nuclei in whole-mounted brains with fluorescently labelled OTs, beginning at the morphological stage corresponding to the start of tiv-AFM measurements (33/34) and repeated for the two subsequent stages encompassing OT turning (35/36 and 37/38). While at the first stage cell densities on both sides of the OT were similar, a clear difference in nuclear densities rostral and caudal to the OT developed at later stages (Figure 3a). Cell densities at the two later stages were significantly higher in the region rostral to the OT (i.e. where tissue was stiffer) than caudal to it, and the overall magnitude of the cell density gradient significantly rose over time (Figure 3b). Plotting the stage-specific gradient in cell body densities against the stiffness gradient revealed a strong linear correlation between them (Pearson’s correlation coefficient ρ=0.97) (Figure 3c). Changes in local cell body densities contribute to the emerging in vivo stiffness gradient in the Xenopus embryo brain. (a) Immunohistochemistry of nuclei (green) in whole-mount control Xenopus embryo brains at successive developmental stages. Stages shown correspond to the onset (stage 33/34), approximate middle (stage 35/36), and end (stage 37/38) of tiv-AFM measurements. OT axons are outlined in purple. 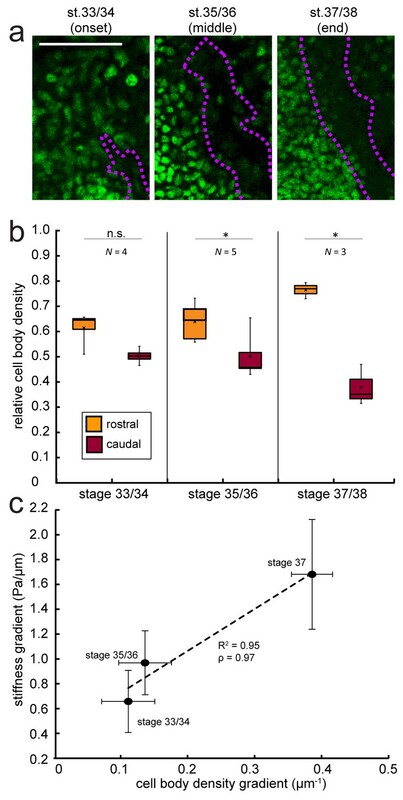 (b) Local cell body densities were significantly higher rostral to the OT than caudal to it at both stage 35/36 (p=0.03, paired Wilcoxon signed-rank test) and stage 37/38 (p=0.04). (c) Gradients in local cell body density and tissue stiffness strongly correlate with each other (Pearson’s correlation coefficient ρ = 0.97). Binned absolute values for the stiffness gradient (in Pa/µm) are plotted against the mean cell density gradient at each developmental stage. Dashed line denotes linear fit (R2 = 0.95). Boxplots show median, first, and third quartiles; whiskers show the spread of the data; ‘×’ indicates the mean. Error bars denote standard error of the mean. *p<0.05. AFM measurement resolution, 20 µm; all scale bars, 100 µm. N denotes number of animals. To test if local cell densities drive the evolution of the stiffness gradient during OT turning, we repeated both nuclear staining and tiv-AFM measurements on embryos treated with the mitotic blocker BI2536 (Lénárt et al., 2007), which inhibits Polo-like kinase 1 and has previously been used to inhibit in vivo cell proliferation in the embryonic retina (Weber et al., 2014). BI2536 also triggered mitotic arrest in brains of developing Xenopus embryos, as the number of phosphorylated histone H3 (pH3)-positive cells (Hugle et al., 2015) was significantly higher in treated compared to control brains, and the cross-sectional area of treated brains was significantly decreased at later stages, indicating a decrease in total cell number (Figure 4a–c). 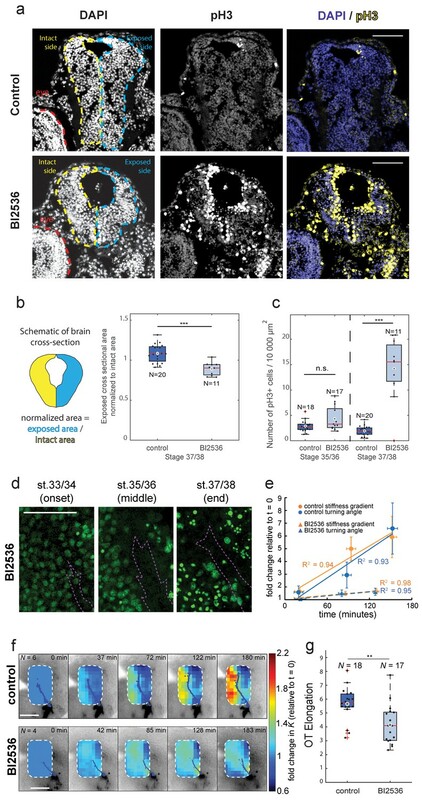 Inspection of the stage-dependent distribution of cells in the developing Xenopus brain suggested that in BI2536-treated brains, the nuclear density was decreased particularly rostral to the OT (Figure 4d, Figure 4—figure supplement 1). In tiv-AFM experiments, blocking cell proliferation significantly attenuated the increase of both the stiffness gradient and the OT turn angle over the time course of the experiment (Figure 4e,f), suggesting that the gradient in cell densities strongly contributed to the stiffness gradient, which in turn helps instruct axon growth. Blocking mitosis in vivo reduces local cell density, decreases mechanical gradients, and attenuates both RGC axon turning and overall OT elongation. (a) Coronal sections of stage 37/38 control and BI2536-treated embryos stained for DAPI and phospho-histone3 (pH3). (b) Boxplot of normalized exposed brain area. The schematic demonstrates how regions were normalized. Normalized brain area is significantly lower in the BI2536-treated embryos compared with controls (p=5.7e-05, Wilcoxon rank-sum test), indicating a decrease in total cell number. (c) The number of pH3+ cells per 10 000 µm2 brain area in BI2536-treated embryos increased significantly over time if compared to controls (p=2.2e-04 at stage 37/38, Wilcoxon rank-sum test). (d) Immunohistochemistry of nuclei (green) in whole-mount mitotic inhibitor-treated Xenopus embryo brains at successive developmental stages. Stages shown correspond approximately to the onset (stage 33/34), middle (stage 35/36), and end (stage 37/38) of tiv-AFM measurements. OT axons are outlined in purple. (e) Plots of the fold-change over time in stiffness gradient (orange) and OT turn angle (blue) for both control and mitotic inhibitor-treated embryos. Blocking mitosis significantly attenuated the rise in both stiffness gradient (p=0.01, linear regression analysis) and OT axon turning (p=0.02). Solid and dashed lines denote linear fits for control and inhibitor-treated embryos, respectively. (f) Time-lapse AFM montages showing fold-changes in brain stiffness in representative control (top; OT axons outlined in blue) and mitotic inhibitor-treated embryos (bottom; OT axons in magenta). The colour scale encodes the fold-change in K at each location on the stiffness map, expressed relative to the values obtained at t = 0 min. (g) Boxplot of OT elongation at stage 37/38. Treatment with BI2536 significantly reduced OT elongation compared to controls (p=0.001, Wilcoxon rank-sum test). Boxplots show median, first, and third quartiles; whiskers show the spread of the data; ‘o’ indicates the mean. Error bars denote standard error of the mean. *p<0.05, **p<0.01, ***p<10−3. AFM measurement resolution, 20 µm; all scale bars, 100 µm. N denotes number of animals except in (b) and (c) where it denotes number of sections. The absence of an increase in tissue stiffness near the advancing OT in BI2536-treated brains was furthermore accompanied by a decrease in OT elongation (Figure 4g). Similarly, OT elongation decreased when brains were softened by manipulating the extracellular matrix (Koser et al., 2016), confirming that tissue stiffness is involved in regulating axon growth in vivo. We obtained similar results using a different mitotic blocker, hydroxyurea/aphidicolin (HUA), which inhibits DNA replication (Gilman et al., 1980; Ikegami et al., 1978) and has previously been used to block cell division in Xenopus embryos (Harris and Hartenstein, 1991). HUA also decreased the gradient in nuclear densities (mainly by reducing nuclear densities rostral to the OT), decreased brain stiffness, and generated defects in OT outgrowth (Figure 4—figure supplement 2). In order to test if the mitotic blocker BI2536 perturbs neuronal mechanosensing, we cultured eye primordia on laminin-coated polyacrylamide substrates of different stiffnesses (Koser et al., 2016), exposed the outgrowing RGC axons to the drug, and quantified axon growth as a function of substrate stiffness. While RGC axon growth on stiff substrates with a shear modulus G’~5,500 Pa was not altered by the presence of BI2536 if compared to control conditions (Figure 4—figure supplement 3e), axons grew longer on soft substrates of G’~200 Pa when they were exposed to 50 nM BI2536 but not when they were exposed to 500 nM (Figure 4—figure supplement 3f), suggesting that the drug might partially impact axon growth on very soft substrates (although no significant differences were observed when axons were grown on slightly stiffer substrates of G’~300 Pa, Figure 4—figure supplement 3d). However, similar to control conditions, axons exposed to different concentrations of BI2536 grew significantly longer on stiff substrates compared to softer substrates. Hence, RGC axons responded to substrate stiffness despite the presence of the mitotic blocker (Figure 4—figure supplement 3g). Our data show that, during early embryonic development, local tissue stiffness may change significantly within only tens of minutes (Figure 2), leading to heterogeneous stiffness distributions which, in the developing Xenopus brain, impact RGC axon growth. These stiffness heterogeneities were largely governed by differential cell proliferation (Figures 3 and 4), which is in agreement with previously published correlations between cell body densities and tissue stiffness (Barriga et al., 2018; Koser et al., 2016; Koser et al., 2015; Weber et al., 2017). Mitotic blockers almost completely abolished the rise of the stiffness gradient (Figure 4), which was accompanied by a decrease in turning angle of the OT, emphasizing the importance of the control of local cell proliferation for mechanosensitive cellular processes in vivo. As changes in substrate stiffness have been shown to promote cell proliferation in vitro (Georges and Janmey, 2005), an increase in cell density might lead to a mechanical positive feedback loop, facilitating further cell proliferation. Perturbing cell division, on the other hand, might alter not only local tissue stiffness but also topological cues in the tissue, which may also provide important signals regulating axon growth. Having fewer cell bodies rostral to the OT might decrease the amount of steric hindrance and provide more space for axons to grow into, contributing to the reduction in OT turning angle (Figure 4e). Our analysis of the correlation between local cell body density gradients and stiffness gradients suggests that other structures may contribute to the stiffness gradient as well (Figure 3c), although perhaps to a smaller degree. Potential candidates include radial glial cells (MacDonald et al., 2015) as well as components of the extracellular matrix (Moeendarbary et al., 2017). Tiv-AFM allows simultaneous time-lapse measurements of tissue mechanics in vivo and optical monitoring of fluorescently labelled structures at the surface of otherwise optically opaque samples, at length and time scales that are relevant for developmental processes. It enabled us for the first time to trace the in vivo mechanical properties of the embryonic Xenopus brain as the embryo developed, and to relate changes in tissue mechanics to a key event in axon pathfinding. As in all other AFM applications, in tiv-AFM forces are applied to sample surfaces, restricting it to biological processes that occur within tens of micrometers away from the surface, such as OT elongation in developing Xenopus embryos. Mapping of the whole Xenopus brain at cellular resolution takes about half an hour, which defines the maximum temporal resolution that can currently be achieved. Future developments of alternative approaches may enable measurements within tissues at even higher rates. However, tiv-AFM in its current form revealed that significant changes in tissue stiffness occur in vivo within tens of minutes, and that these changes have significant implications for a biological process, the outgrowth of RGC axons along the developing embryonic brain. More broadly, tiv-AFM can also be easily adapted for in vivo applications in other small organisms, or alternatively in tissues ex vivo. It can be used to study cellular responses to a range of mechanical stimuli via the AFM in vivo, such as sustained compression (Barriga et al., 2018; Koser et al., 2016), or to track the temporal mechanical response of tissues or organs to different pharmacological treatments (such as the mitotic inhibitor used here). Additionally, the setup is very versatile and can be further expanded, for example, by combining it with calcium imaging to investigate how cellular activity is regulated by changes in tissue stiffness during development and pathology. Tiv-AFM will greatly expand the range of bio-AFM experiments possible, allowing for more scope both for a detailed characterisation of in vivo tissue mechanics during development and disease progression, and for testing how mechanics shapes cell behaviour and function. All chemicals and reagents were obtained from Sigma-Aldrich unless otherwise noted. NXR_0.0031; RRID:SCR_013731 Wild-type strain Xla. (Franze, 2018a), https://github.com/FranzeLab/Image-processing-and-analysis (Franze, 2018b) and https://github.com/FranzeLab/Instrument-Control (Franze, 2018c; copies archived at https://github.com/elifesciences-publications/Image-processing-and-analysis,https://github.com/elifesciences-publications/Instrument-Control and https://github.com/elifesciences-publications/AFM-data-analysis-and-processing). All animal experiments were approved by the Ethical Review Committee of the University of Cambridge and complied with guidelines set by the UK Home Office. Single-cell-stage, wild-type Xenopus laevis embryos of both sexes were obtained via in vitro fertilisation. Embryos were reared in 0.1× Modified Barth’s Saline (MBS) at 14–18°C to reach the desired developmental stage, as described by Nieuwkoop and Faber, 1958. All embryos used in this study were below stage 45. In vivo fluorescence labelling of optic tract (OT) axons. To visualise the developing OT during time-lapse AFM experiments, an ath5::GAP-eGFP construct (pCS2+ vector) (Poggi et al., 2005; Das et al., 2003) was injected (100 pg/5 nL) into one dorsal blastomere of embryos at the 4 cell stage. The construct consisted of a membrane-tagged GFP fusion under control of the retinal ganglion cell (RGC)-specific atonal homolog 5 promoter (Kanekar et al., 1997). This selectively labelled RGCs in a single retina, the axons of which grew across the optic chiasm and into the unlabelled brain hemisphere. Stage 33/34 embryos were anaesthetised, the eye primordium was removed and the underlying brain hemisphere exposed as described (Chien et al., 1993; Irie et al., 2002). Briefly, embryos were transferred to 1.3 × MBS solution (composition: 1.3 × MBS with 0.04% (w/v) MS222 anaesthetic (3-aminobenzoic acid ethyl ester methanesulfonate) and 1 × penicillin/streptomycin/Fungizone (P/S/F; Lonza), pH 7.4). The higher osmolarity retards skin regrowth, allowing for experiments spanning several hours. Embryos were immobilised on low Petri dishes (TPP, Switzerland) coated with Sylgard 184 using bent 0.2 mm minutien pins, with one side of the body facing up. The eye, epidermis, and dura were removed with 0.1 or 0.15 mm minutien pins and fine forceps to expose one brain hemisphere from the dorsal to ventral midline and from the hindbrain to the telencephalon. Embryos were then immediately used for time-lapse in vivo AFM (tiv-AFM) measurements or, alternatively, transferred to a 4-well plate containing either 1.3× MBS solution+50 µM BI2536 (MedChem Express) (control, 1.3× MBS solution + 0.5% v/v DMSO) or 1.3× MBS solution + 20 mM hydroxyurea and 150 µM aphidicolin (control, 1.3× MBS solution + 1.5% v/v DMSO) and allowed to develop at ~25°C until the desired developmental stage. Embryo viability throughout all in vivo experiments was assessed by the presence of a visible heartbeat (which begins at st. 33/34 (Gurdon et al., 1997)). BI2536 inhibitor or mock-treated embryos were fixed at the requisite stages in 4% PFA overnight at 4°C, washed thrice in phosphate-buffered saline (PBS) for 10 min, and kept in 30% sucrose for 1 hr at 4°C. The embryos were embedded in optimum cutting temperature compound (OCT, VWR). 12µm-thick coronal sections were made and collected on Superfrost plus slides (ThermoScientific). Polyacrylamide hydrogels were prepared as previously described (Koser et al., 2016). Briefly, 19 mm ‘bottom’ coverslips were coated with 1N NaOH using a cotton bud and allowed to air dry. Coverslips were treated with (3-aminopropyl)trimethoxysilane (APTMS) for 3 min, washed thoroughly, treated with 0.5% glutaraldehyde solution for 30 min, and then washed and allowed to air-dry. 18 mm ‘top’ coverslips were treated with Rain-X (Shell Car Care International Ltd, UK) for 10 min and then dried. Gel pre-mixes were prepared using 40% (w/v) acrylamide (AA) solution and 2% bis-acrylamide (Bis-AA) solution (Fisher Scientific, UK, or SIGMA) diluted in PBS. Concentration titration measurements used a premix composition previously determined to give a shear modulus G (a measure of stiffness) of ~300 Pa (5% AA, 0.07% Bis-AA in PBS). 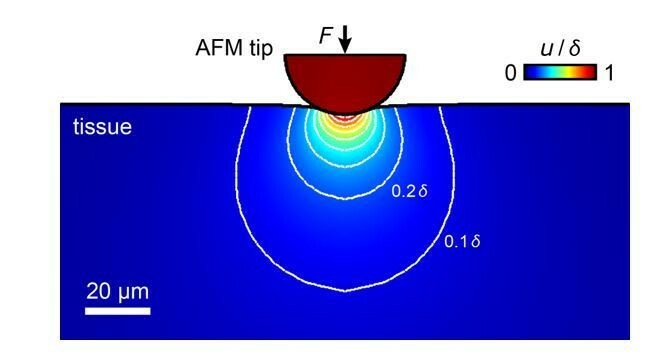 For gels used for stiffness sensing experiments, the precise stiffness was measured using AFM. Stiff gels were comprised of 7.5% AA/0.2% Bis-AA in PBS, resulting in a shear modulus of G ~5,500 Pa; soft gels were comprised of 5% AA/0.04% Bis-AA in PBS, resulting in G ~200 Pa.
Premix polymerization was initiated by adding 5 µL ammonium persulfate followed by 1.5 µL of N,N,N’,N’-tetramethylethylenediamine (TEMED, ThermoFisher). 25 µL of premix was pipetted onto the bottom coverslip and the top coverslip placed on top. Once the gel had polymerized, the top coverslip was removed and gels were treated with hydrazine hydrate for 3.5–4 hr, and then with 5% acetic acid (ACROS Organics) for 1 hr. Gels were then washed, sterilized by 30 min UV treatment, and functionalized with 10 µg/mL Poly-D-lysine (MW 70,000–150,000) overnight followed by 5 µg/mL laminin for 2 hr immediately prior to plating cells. For eye primordia culture experiments, stage 33/34 or 35/36 embryos were placed in a Petri dish coated with Sylgard 184 (Dow Corning) and anaesthetized with 0.04% (w/v) MS222 solution (dissolved in 1 × MBS + 1% v/v PSF, adjusted to pH 7.6–7.8, and filter-sterilized). Whole eye primordia were dissected out using insect pins, and placed onto hydrogels with the lens facing up. BI2536 or control solution (DMSO) was added 2 hr after explants were plated. Dishes were cultured at 20°C for 22–24 hr in Xenopus cell culture medium (60% L15 medium + 1× PSF, adjusted to pH 7.6–7.8, and filter sterilized). In all experiments, DMSO controls utilized the amount of DMSO equivalent to that in the most concentrated BI 2536 condition (0.1% v/v for concentration titration, 0.01% v/v for stiffness sensing experiments). Explants were imaged on a Leica DMi8 inverted microscope with a 10× NA = 0.4 phase contrast objective. Eye primordia explant morphology was analyzed using the Sholl Analysis plugin in Fiji (Ferreira et al., 2014). An ellipse was fitted to the explant, and the innermost (starting) radius set to R =A/π, with A being the ellipse area. Images were filtered with an FFT bandpass filter to correct uneven background illumination and manually thresholded. The outer radius was set to a point beyond the reach of the longest axon. Spacing between consecutive measurements was set to 5 µm. ‘Median sholl radius’ was calculated as the median outgrowth radius reached by axons of a particular explant. Where required, to visualise the OT and nuclei for cell body density measurements, embryos at the desired developmental stage were fixed in 4% paraformaldehyde for 1.5–2 hr at room temperature or overnight at 4°C. OTs were either labelled with ath5::GAP-eGFP or by injecting a solution of DiI crystals diluted in ethanol at the boundary between lens and the retina (as previously described Wizenmann et al., 2009). Fixed brains were then dissected out and stained with 4,6-diamidino-2-phenylindole (DAPI; 1 µg/ml). Stained specimens were mounted in either Fluoromount-G (eBioscience, UK; ath5::GAP-eGFP-labelled OTs) or 1 × PBS (DiI-labelled OTs) and the lateral brain surface, including the OT, was imaged using an SP-8 confocal microscope (SP8, Leica Microsystems, UK; 20× air, NA = 0.75; z-step size = 1 μm). Sectioned tissues on slides were washed thrice in PBS, followed by three 10 min washes in PBS with 0.1% TritonX. The sections were blocked in 5% goat serum in PBS with 0.1% TritonX for 30–45 min and incubated with Rabbit polyclonal anti-phospho-Histone H3 (Ser10) (EMD Millipore, 06–570, dilution = 1:1000 in blocking solution) overnight at 4°C or for 2 hr at room temperature. This was followed by three 10 min washes in PBS and secondary antibody incubation with goat anti-rabbit Alexa Fluor 594 (Abcam, ab150084, dilution = 1:500 in blocking solution) for 45–60 min. The slides were washed twice for 10 min with PBS and nuclei were labeled using 4,6-diamidino-2-phenylindole (DAPI, 1 μg/ml). Sections were mounted with Fluoromount-G (eBioscience) and imaged with a confocal microscope (SP8, Leica Microsystems, UK; 20×/0.75 air and 63×/1.4 oil). Z-stacks were taken across 8 µm of tissue (z-step size = 1 µm). Only slices with eye tissue present were selected, to reliably ensure that the brain sections imaged and analysed were indeed exposed to the treatment solutions. This also allowed us to easily ascertain the intact- versus exposed- brain side in each section. Tipless silicon cantilevers (Arrow-TL1, NanoWorld) were calibrated using the thermal noise method (Hutter and Bechhoefer, 1993) to determine the spring constant k, and those with k between 0.02–0.04 N/m were selected. Monodisperse spherical polystyrene beads (diameter 37.28 ± 0.34 µm; microParticles GmbH) were glued to the cantilever ends as probes. Cantilevers were mounted on a CellHesion-200 AFM head (JPK Instruments), which was set up on an x/y motorised stage (JPK Instruments) controlled by custom-written Python scripts (Koser et al., 2016). Indentation measurements (maximum indentation force: 10 nN, approach speed: 5 µm/s, data rate: 1,000 Hz) were performed automatically in a user-defined rectangular grid to create a 2-D ‘stiffness map’ of the area. After each measurement, the cantilever was retracted by 100 µm, and the stage moved by a set distance (20–25 µm) to the next position (Koser et al., 2016). To allow simultaneous time-lapse imaging of the growing OT and in vivo stiffness measurements of live Xenopus brains, which are optically opaque, an upright epifluorescence set-up was custom-fit above the AFM head, which was based on a Zeiss AxioZoom V16 fluorescence stereomicroscope (without eyepieces). The microscope was mounted on a custom-designed horizontal sliding stand (parts obtained from ThorLabs) via a custom-made adaptor (K-Tec Microscope Services) bolted to the side of the microscope (Figure 1—figure supplement 1). A long working distance objective with automatic zoom and high NA (PlanApo Z 0.5×/0.125, working distance 114 mm, Zeiss) allowed in vivo fluorescence imaging of RGC axons through the transparent AFM head, which was re-fitted with optical elements optimised for fluorescence imaging. The sample was illuminated through the AFM head using a metal halide lamp, and bright-field as well as epifluorescence images of the brain collected with an sCMOS camera (Andor Zyla 4.2; quantum efficiency 82%) (Figure 1a,b). Stage 33/34 embryos with ath5::GAP-eGFP-labelled OTs were prepared with one brain hemisphere exposed as described above, and those in which the OT was clearly visible (but had not yet formed the mid-OT bend) were selected. Embryos were mounted on the AFM motorised stage and a measurement region of approximately 150 × 250 µm defined to include both the growing OT and the region of the mid-diencephalic turn. Images of the upper right and lower left corners of the selected region (with cantilever approached) were collected to identify the precise area mapped by the AFM. A stiffness map of the area was collected and the map iterated over the same area every ~35 min. At the end of every line in the measurement grid, the stage was moved back to a pre-defined location and a fluorescence image of the optic tract automatically collected. Temperature was maintained at 25°C for the duration of the measurement by a PetriDish Heater (JPK Instruments). where F is the applied force, K the reduced apparent elastic modulus E/(1-ν2) (with Poisson ratio ν), R the radius of the indenter, and δ is sample indentation (Crick and Yin, 2007; Hertz, 1882). Force-distance curves were analysed at the maximum applied force F = 10 nN. Points where the AFM data were not analysable were excluded; criteria for excluding individual force-distance curves were (1) inability to apply linear fits through the baseline region, for example due to noise, and (2) inability to apply good-quality Hertzian fits to the indentation region, that is, the fit did not align with the raw data. To minimise noise for region-of-interest analysis of small areas, previously sorted, gridded AFM data were smoothed in x-, y-, and time dimensions using an algorithm based on the discrete cosine transform by Garcia et al (Garcia, 2010; Garcia, 2011). Briefly, an iteratively weighted version of the penalized least squares approach was used to smooth the data and interpolate missing values where the force-distance curves were not analysable. Stiffness data from each experiment were arranged into a 3D array (x*y*frame number) and used as an argument for the smoothn.m MATLAB implementation of the algorithm (Garcia, 2010). This algorithm has the advantage of using the entire data set to interpolate missing values, as opposed to only the nearest neighbouring data (as, for example, in other smoothing methods such as a simple spline interpolation). For visual presentation of interpolated stiffness data, additional arrays of robustly smoothed K values were generated using the separate ‘robust’ option available in smoothn.m. This automatically reduces the weight assigned to high-leverage points and outliers, which optimises visualisation of overall changes in stiffness. To generate time-lapse montages of both raw and robustly smoothed AFM data, values of K were converted to 8-bit scale, colour-coded maps using the desired MATLAB colourmap pre-set. The resulting stiffness maps were then mapped onto images of the brain and OT using custom-written MATLAB scripts (Koser et al., 2016). When linear fits to AFM data and OT turning angles were required, the built-in MATLAB first degree polynomial fit was used in all cases. For each embryo, in vivo time-lapse movies of the growing OT were created by collating fluorescence images taken at the beginning of every successive AFM stiffness map. The magnitude of the OT turn was calculated from each frame of these movies using the FIJI Angle tool. Three points were defined manually (chiasm, mid-diencephalic turn, and end of OT) such that the two lines drawn through these points ran through the centre of the OT. Each measurement was repeated three times, averaged, and subtracted from 180° to give the angle through which the OT had turned; a positive value denotes turning in the caudal direction. Maximum projections were made across 10 µm confocal image stacks of wholemount brains with DiI-labelled OTs. The OTs were manually outlined in Adobe Illustrator. Elongation of the OT was calculated by the major-to-minor axis ratio using a previously described automated algorithm in Matlab (Koser et al., 2016). In short, axes were determined by fitting ellipses, with the same normalized second central moment as the OT area, around the OTs. Confocal images taken with the 20 × air objective were imported into FIJI. Maximum projections were made of the stacks (z-stack height = 8 µm). The brain was identified in each section and both intact and exposed hemispheres were outlined. The area occupied by nuclei in each brain hemisphere was measured using the ‘Analyse > Measure’ tool. Normalised brain areas were obtained by calculating the ratio of exposed brain area to intact brain area. Confocal images taken with the 20 × air objective were imported into FIJI. Maximum projections were made of the stacks (z-stack height = 8 µm) and pH3+ cells were counted and normalized to the total measured brain area in each section. The data is presented as the number of pH3+ cells per 10,000 µm2 of brain tissue. Data were collected from at least three independent experiments (N ≥ 3). The order of data collection was randomized with no blinding and no data were excluded from the analysis. Non-parametric tests as well as linear regression analysis were used for statistical analyses of the data as described in the figure captions. R2 values provide an estimate of the quality of the fits used in the plots. Pearson’s correlation coefficient, on the other hand, provides a measure of the magnitude of correlation between the cell body density gradient and the stiffness gradient. Biomechanics and Modeling in Mechanobiology 6:199–210. Computational Statistics & Data Analysis 54:1167–1178. Methods in Cell Biology, 125, 10.1016/bs.mcb.2014.10.005, 25640431. Journal of Applied Physiology 98:1547–1553. CP Emerson, HL Sweeney, editors. Elsevier. Journal Fur Die Reine Und Angewandte Mathematik 92:156–171. The Journal of Neuroscience 9:3123–3145. Cell Death & Differentiation 22:1946–1956. Review of Scientific Instruments 64:1868–1873. The Journal of Cell Biology 210:1075–1083. Journal of Magnetic Resonance Imaging 34:494–498. 65, Normal Table of Xenopus Laevis (Daudin), Copeia, 1958, UK, Taylor and Francis. The Journal of Cell Biology 171:991–999. Thank you for submitting your article "Rapid changes in tissue mechanics regulate cell behaviour in the developing embryonic brain" for consideration by eLife. Your article has been reviewed by three peer reviewers, and the evaluation has been overseen by a Reviewing Editor and Marianne Bronner as the Senior Editor. The following individuals involved in review of your submission have agreed to reveal their identity: Paola Bovolenta (Reviewer #1); Valerie Castellani (Reviewer #2). The three reviewers appreciated your efforts to probe how dynamic changes in tissue mechanics have a close relationship with developmental processes, here, with a focus on axonal growth. Your findings that the pathway that retinal ganglion cell axons follow in the Xenopus brain is influenced by relatively rapid changes in tissue stiffness on which the axons grow, and that increasing stiffness correlates with enhanced cell density/proliferation, are indeed novel. Your approach of simultaneously observing and quantifying tissue stiffness and cell movements using atomic force microscopy with fluorescence imaging is exciting and will appeal to the growing number of groups interested in tissue morphogenesis. 1) Coronal sections of control and BI2536 treated embryos showing nuclei (DAPI stained) and glial endfeet (GFAP or Nestin labelling). 2) Labelling sections with pH3 or other mitotic cell markers. 3) Effects of the BI2536 inhibitor: Additional movies are needed (Figure 2F, N= only 2 for the BI2536 condition). 4) Check whether RGC axons grow and sense stiffness normally in vitro in presence of BI2536 (for example, using the axon outgrowth assay described in Koser et al., 2016). 5) Calculate optic tract (OT) elongation in control and BI2536-treated conditions. Related to BI2536 treatment and turning in the optic tract: does BI2536 generally affect axon growth along the optic tract in vivo? 6) Demonstrate that repeated AFM measurements do not affect OT turning (by comparing with movies without AFM measures). 7) Confirm with a second drug that cell density controls brain stiffness and RGC axon turning. 1) State in the text the optical resolution and the accuracy of the AFM measure relative to the surface distance (in other words, is AFM producing a measure of the stiffness of the tissues 10μm or 100μm below the surface scanned by the probe?). 2) Provide illustrations of the angle measurements (in the video in Figure 1, it seems that the turn is initiated at 37 minutes). 3) Show the ROIs used to quantify the stiffness gradient and the boxplot of the mean K values in rostral and caudal regions at different time points. In addition, using different ROIs along the OT would strengthen the specificity of the correlation between stiffness gradient and turning. 4) Show several examples of the stiffness changes to better appreciate the spatial stereotypy relative to OT development. 5) Figure 1D, related to text "a stiffness gradient arose, mostly due to rising stiffness of tissue rostral to the OT". 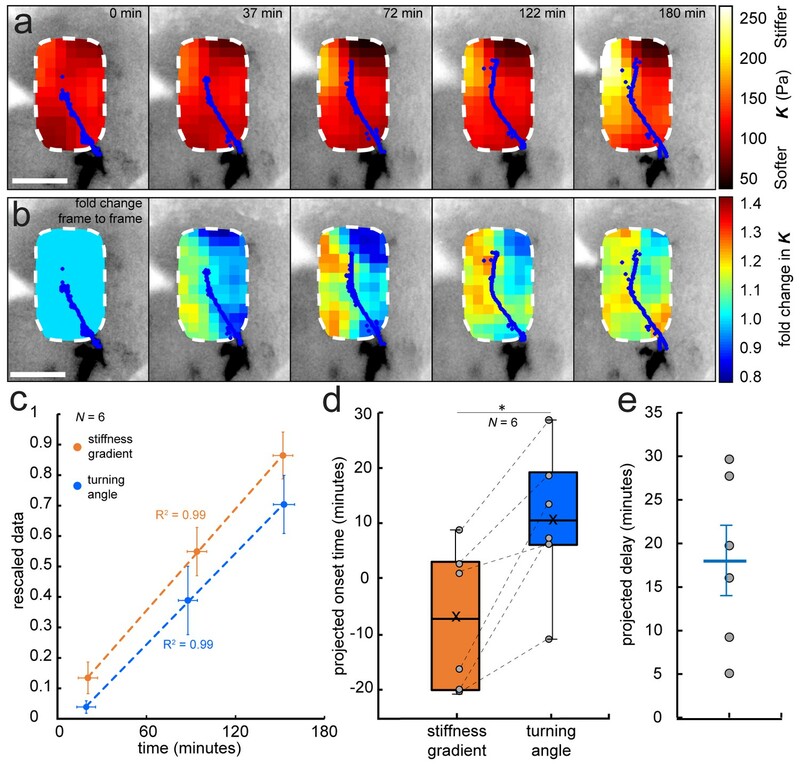 Some of the heatmap data (e.g., Figure 1—figure supplement 2C) suggests that there is decreasing stiffness on the caudal side, and relative cell density data (Figure 2D) suggests that there is decreasing cell density on the caudal side as well. Can the authors comment on the rostral-caudal stiffness v cell density? Is there some underlying biology to account for this? 6) Explain why only 3 time points are presented in the graph Figure 2A and G even though measurements are made every 35 minutes. 7) Figure 2B: According to the graph, it appears that the stiffness gradient is projected to form at 8-10 minutes. This suggests that it may begin to form prior to the beginning of the experiments presented (if the gradient forms linearly at those earlier times). Have the authors tried starting the experiments earlier? The manner in which the stiffness gradient forms (linearly or non-linearly) may have implications for the mechanism(s) initiating and influencing stiffness. 8) Specify the estimated delay between gradient stiffness establishment and OT caudal turn (15-18 minutes). Paired analysis of the onset times of stiffness gradient and turn for each video (ladder graphic) would strengthen the arguments. It would be interesting to have an estimate of the stiffness differences that would lead to axon turning. This would be helpful together with point 4 to make predictions and to enrich the model proposed in Koser et al., 2016. 9) Show a 3D reconstruction of the Z-stack used for Figure 2C and specify the total stack height. 10) Explain how "cell body density gradients" were calculated (Figure 2E) (only "relative cell body density" is described in the Materials and methods). The authors should take into account that quantification made on a Z projection will lead to loss of information that will decrease the sensitivity of the analysis. Figure 2E suggests that a more balanced conclusion should be drawn from the experiment, as part of gradient stiffness is independent of cell density gradient (gradient stiffness would thus be 0.4 for no cell density gradient). 11) Provide relative cell body density for the BI2536 condition, as done in Figure 2D for the control (indeed, the authors stated that "cell density gradient was significantly decreased compare to controls, particularly at later stages (Figure 2C)"). 12) The Materials and methods section indicates that relative density involves ratio of 2D area in the image occupied by nuclei over total area (this does not appear to be a cell count). This measurement could be affected by differences in nuclear size. Have the authors measured nuclear size over time? Does this change? Is nuclear size different in BI2536-treated embryos? Also, it is difficult to see nuclei on the caudal side of the optic tract in Figure 2C (control). 13) Again, related BI2536 and cell density measurements, over time for BI2536-treated embryos: It would be useful to know if the BI2536 caused apoptosis (leading to an overall reduction in density)? The nuclei look somewhat condensed on what appears to be the rostral side of the tract in the BI2536 sample by st. 37 (Figure 2C). 14) Show a different control movie in Figure 2F (OT trace looks the same as in Figure 1). 15) Justify the changes of presentation between Figure 2A and G.
16) Explain what BI2536 targets (inhibitor of polo-like kinase). 17) Explain differences between coefficient R2= 0.95 in Figure 2C and Pearsons coefficient in the text (p=0.97). Add scale bars in Figure 2C and F.
1) You suggest that the "gradient in cell densities is responsible for the stiffness gradient". However, the opposite could be true, as changes in stiffness have been shown to promote proliferation (should be referenced). In addition, as you previously showed that ECM manipulation changes the tissue stiffness and axon trajectory (Koser et al., 2016), it would be welcome to discuss whether you have assessed whether changes in cell density correlate with changes in ECM deposit and if BI2536 impairs it. 2) In the last paragraph, you discuss applications of tiv-AFM to other possible contexts. Limitations of the system should be also mentioned. We have done the suggested experiments as far as possible. DAPI staining of coronal sections confirmed a decrease in overall cell numbers after treatment with BI2536 (Figure 4A, B). However, GFAP is not expressed in Xenopus brains at the early developmental stages we were interested in (Messenger and Warner, Development, 1989; Martinez-De Luna et al., Dev Biol, 2017; and our own data). Furthermore, we could not find a Nestin antibody with sequence similarities above 85% with Xenopus (we tested two commercially available antibodies, Abcam ab134017 Chicken polyclonal to Nestin and ab81462 Rat monoclonal [7A3] to Nestin on coronal sections anyway, but with limited success). We also stained for vimentin, which is another glial cell marker. While we obtained a good signal from that approach, we could not distinguish individual glial cell endfeet. As we cannot make any strong conclusions about the contribution of glial cells to the stiffness gradients and axon turning based on these data (see Author response image 1), we now discuss their potential involvement in the main text. Coronal brain sections of stage 37/38 Xenopus embryos stained for DAPI (red) and Nestin (above) or Vimentin (below) (white). Control animals (left) and BI2536-treated animals (right); the exposed side is on the right hand side of each image. All scale bars are 20 µm. We have now labelled coronal sections with an antibody to detect histone H3 phosphorylated at serine 10, a marker of mitotic cells. Ser10 phosphorylation begins in G2 and decreases upon exit from mitosis. We found that the BI2536 treatment successfully triggers mitotic arrest as the number of pH3-positive cells is significantly higher in treated compared to control brains. These data have been added to Figure 4A, C.
We have repeated these experiments with 2 more biological replicates and updated the numbers in the paper (N = 4). The new sets of experiments fully agree with our previous data, confirming reproducibility of the experiments and that the stiffness gradients is almost completely abolished after BI2536 treatment (Figure 4E). We have done the suggested in vitroexperiments. Axons exposed to 50nM and 500nM BI2536 still sense and respond to the stiffness of their environment, suggesting that the main effect of the drug is through a modification of tissue mechanics. The new data have been added to Figure 4—figure supplement 3. We have calculated OT elongation as suggested and find differences between controls and BI2536-ând HUA-treated animals. In the treated animals, elongation is significantly reduced, which we now show in Figure 4G and Figure 4—figure supplement 2D. As brain tissue stiffness is decreased in treated animals with decreased nuclear densities (Figure 4E, F, Figure 4—figure supplement 2E, F), which is in agreement with an important role of cell body density in regulating tissue stiffness, a reduction in OT elongation is in line with our previous publication (Koser et al., 2016). To address this point, we conducted time-lapse AFM measurements (i.e. repeated AFM mapping over a time course of at least 3 hours) on a group of embryos while we exposed another group to the same conditions but did not do any force measurements. At the end of the experiments (i.e., at stage 37/38), embryos were fixed, optic tracts labelled with DiI, and their elongation and turning angles measured. We did not find any significant differences between the groups, suggesting that repeated AFM measurements do not affect OT turning. We have added the new data to Figure 2—figure supplement 2 and the fifth paragraph of the main text. We have now used a second mitotic inhibitor treatment, hydroxyurea/aphidicolin (HUA) (which has previously been used in Xenopus embyros in vivo: Harris and Hartenstein, 1991), which resulted in a very similar optic tract phenotype as seen in BI2536-treated brains, with significantly reduced OT elongation and brain stiffness. These experiments are now shown in Figure 4—figure supplement 2. AFM is applied to the surface of a sample. The measured stiffness is a composite property of structures within the top layers of the sample, with a larger contribution of structures that are closer to the surface. The total depth that contributes to the measured value depends on the mechanical properties of the sample, the force applied, and the contact area between probe and sample. In our experiments, we indent the samples by ~3-4 µm. We estimate structures to contribute to the measured stiffness mainly within the top ~20-30 µm (see simulation in Author response image 2), which includes the region through which RGC axons grow (Holt, J Neurosci, 1989). We now mention this in the fourth paragraph of the main text. Simulation of the propagation of tissue deformation during an AFM measurement of a tissue with an elastic modulus of K = 300 Pa with an applied maximum force F = 10 nN and a 37 µm bead as probe. The sample is indented by 3.4 µm, tissue deformation propagates into deeper layers. Most contributions to the measured elastic modulus come from structures within the top ~20-30 µm, within which RGC axons grow. Done as suggested (Figure 1C). We now show the ROIs used to quantify the stiffness gradient and boxplots of the median K values in rostral and caudal regions at different time points in Figure 2—figure supplement 1. However, we have chosen the ROIs to be directly in front of the advancing OT axons because this is the region that growth cones will be sensing. Therefore, we would rather not include different ROIs along the OT to avoid confusion, as it is not clear whether these would contribute to axon guidance in any way. We now show two more examples of time-lapse stiffness maps in Figure 2—figure supplement 3. We generally see a strong correlation between local cell body densities and tissue stiffness. Accordingly, tissue stiffness increases rostral to the OT, where cell density increases during development. Caudal to the OT, cell density decreases slightly in some but not all embryos, and accordingly we don’t see statistically significant differences in tissue stiffness caudal to the OT. Our aim was to match the mechanics measurements to the three established developmental stages of Xenopus embryos encompassing the duration of our experiments (stages 33/34, 35/36, and 37/38), in order to enable meaningful comparisons with local cell body densities, which were assessed at these stages. Therefore, values from stiffness maps had to be pooled. We now justify this procedure in the caption of Figure 2. Our data indeed suggest that stiffness gradients may start forming a few minutes before the start of our measurements. However, our data strongly indicate that the stiffness gradient forms rather linearly during the following ~3 hours between stage 33/34, when the pioneering axons first leave the optic chiasm and enter the diencephalon, and stage 37/38, when axons have turned in the mid-diencephalon (Figure 2A). Measurements at earlier developmental stages would be technically highly challenging. These are indeed excellent suggestions. We now specify the delay of 18 minutes in the seventh paragraph of the main text and in Figure 2E. Furthermore, we include a ladder graphic as suggested, in addition to our paired analysis of the onset times, in Figure 2D. We now also include an estimate of the minimum stiffness gradient that would lead to axon turning, which is (0.9 ± 0.4) Pa/µm. As mentioned in the Materials and methods, we only recorded three optical planes in each stack to make sure we capture all nuclei in that region. Hence, a 3D reconstruction would not add to the information that is already provided. Moreover, the coronal sections that we now added (see experiment 1 above, Figure 4) contain information about the depth-distribution of nuclei, which we hope addresses this point. We apologise for this oversight and added an explanation of cell body density gradient calculations to the Materials and methods. As mentioned above, our Z projections consisted of three optical slices only that were spaced by 2 µm, so that we would expect the loss of information to be rather small. The extrapolation of the fit in Figure 2E is an excellent point. When we force the fit through the coordinate origin (which would reflect a scenario in which the cell body density gradient is the only major contributor to the stiffness gradient), the R2 value is still 0.74. However, we agree with the reviewer that other tissue components might very well also contribute to setting up the stiffness gradient to some degree, and we now tone our conclusions down and mention potential other sources including radial glial cells and the extracellular matrix. We would like to point out, however, that even if other cellular and/or extracellular components are involved in setting up an initial stiffness gradient (which would not be strong enough to cause axon turning), our experiments with two different mitotic blockers strongly suggest that the cell body density gradient is responsible for the development of this stiffness gradient to the point where it impacts axon turning, as perturbations of mitosis abolish the stiffness gradient almost completely. The reviewer is correct, we intentionally quantified the area occupied by nuclei rather than their number. Nuclei are usually much stiffer than, for example, cytoplasm. From a mechanical point of view (under the assumption that nuclear stiffness does not significantly vary with volume but rather with lamin A/C content, see for example Swift et al., Science, 2013), it does not matter whether the total nuclear area increases because of a change in nuclear size or number. The number of nuclei caudal of the OT is indeed very low, which likely explains (at least to some degree) why the tissue in that region is softer than cranial of the OT, where a significantly larger volume is covered by nuclei. We cannot rule out that BI2536 caused some degree of apoptosis at the application site. However, again, from a mechanical point of view it does not matter much why nuclear density changes. The scope of this paper is to show that local tissue stiffness may change rather rapidly during development, and that these changes are largely governed by changes in nuclear densities. We would like to point out that retinal ganglion cells, whose axons grow along the optic tract, are located within intact eye primordia and are thus not exposed to the drug in exposed brain preparations. We intentionally showed the same data in Figures 1 and 2, as we wanted to make a comparison easier (as Figure 1 shows absolute stiffness and Figure 2 relative changes in stiffness). However, we see the value of showing different time lapse data and added two more series to the supplement (Figure 2—figure supplement 3). In Figure 2A (now Figure 2C), we show the stiffness gradients and turning angles normalised by the maximum values measured, which allowed us to extrapolate linear fits and determine the relative onset of both gradients and angles (leading straight to current Figures 2D, E). This normalisation is very useful as absolute values will vary slightly not only between individual animals but also between different AFM cantilevers. In Figure 2G (now Figure 3C), however, we wanted to compare treated embryos with controls. If we would follow the same normalisation process, the gradients of both groups would terminate at 1 and no differences would be visible. This problem was circumvented by normalising with respect to the first measurement in a time series (i.e., to the lowest value). This way, Figure 2G shows clearly that in controls but not in treated animals stiffness gradients and the turning angles are increasing over time. Done as suggested (main text, tenth paragraph). The R2 value provides an estimate of the quality of fits to data distributions. Pearson’s correlation coefficient, on the other hand, provides a measure of the magnitude of correlation between the cell body density gradient and the stiffness gradient. We have added this information to the Methods. We have now increased the visibility of the scale bars in the figures. We would like to thank the reviewer for this comment. If cell density-independent changes in tissue stiffness would drive the growth of the stiffness gradient and independently lead to differential cell proliferation, interfering with cell proliferation should not diminish the stiffness gradient. However, our data show that the application of BI2536 almost completely abolishes the stiffness gradient, suggesting that it is rather unlikely that a cell density-independent stiffness gradient is responsible for the gradient in cell densities as suggested by the reviewer. However, the increase in cell density and thus tissue stiffness could provide a positive feedback signal, facilitating further cell proliferation as suggested by the reviewer. We have added this to the Discussion and provide a relevant reference. We have not assessed whether changes in cell density correlate with changes in ECM deposition and if BI2536 impairs it. At the stages investigated in this study, there is very little ECM in the brain (in Koser et al., 2016, we added ECM to the tissue), and we would thus not expect a major effect either due to or impacting the ECM. However, we have added a potential contribution of the ECM to tissue stiffness in the Discussion. This is a good point. We now discuss explicitly limitations of tiv-AFM, which are mainly that the method is restricted to surfaces and the time each map takes, which currently limits whole-brain scans at cellular spatial resolution to a temporal resolution of about half an hour. The authors would like to thank Alex Winkel (JPK Instruments), Katrin Mooslehner, Asha Dwivedy, Liz Williams, and Julia Becker for technical help, Alex Robinson and Max Jakobs for scientific discussions and logistical support, as well as the Wellcome Trust (grant 099743/Z/12/Z to AJT), the Cambridge Philosophical Society and the Cambridge Trusts (studentships to AJT), the Malaysian Commonwealth Studies Centre (funding to EKP), the UK Engineering and Physical Sciences Research Council Cambridge NanoDTC (grant EP/L015978/1 to IBD), the Herchel Smith fund (studentship to SKF), the European Research Council (Advanced Grant 322817 to CEH and Consolidator Award 772426 to KF), the UK Biotechnology and Biological Sciences Research Council (BB/M020630/1 and BB/N006402/1 to KF), the UK Medical Research Council (Career Development Award G1100312/1 to KF), and the Eunice Kennedy Shriver National Institute Of Child Health and Human Development of the National Institutes of Health under Award Number R21HD080585 (to KF) for funding support. The content is solely the responsibility of the authors and does not necessarily represent the official views of the National Institutes of Health. © 2019, Thompson et al.